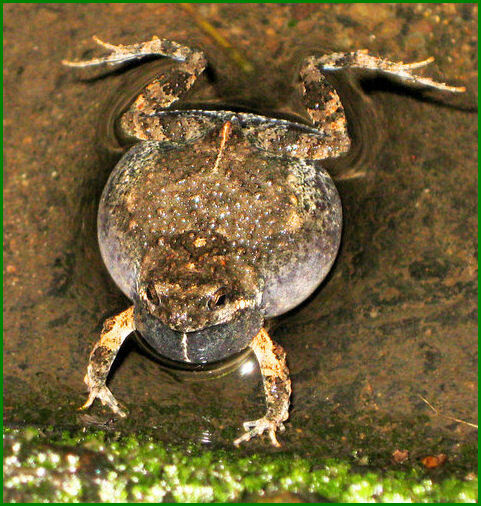 Male túngara frogs (Engystomops pustulosusgather) in shallow pools of water at night and let out long mating calls. Females visit these pools, listen to a few calls and then quickly pick mates. It’s a bit like speed dating. A male call consists of a whine followed by a series of grunts, or “chucks.” New research suggests that females judge males on these chucks — not the absolute number, but the ratio of one frog’s chucks to another. During the study in Panama, many female frogs seemed to prefer two chucks over a single chuck. But most did not show a preference between three chucks and two chucks. It’s a concept humans can relate to, said Karin Akre, an evolutionary biologist at the University of Texas at Austin who led the research. The call of a male túngara frog consists of a whine and grunting. The frogs are not alone at night; also lurking nearby are bats that prey on the frogs. Surprisingly, the researchers found that the bats use the same strategy as female frogs when selecting prey to single out. Like female frogs, they are drawn to males emitting more chucks, and make their determinations based on the ratio, rather than the absolute difference. “They show, really, the exact same preference,” Dr. Akre said. Given the different auditory systems of the two species(one is a mammal and one is an amphibian), “it’s surprising and interesting that they share this cognitive ability,” she said.